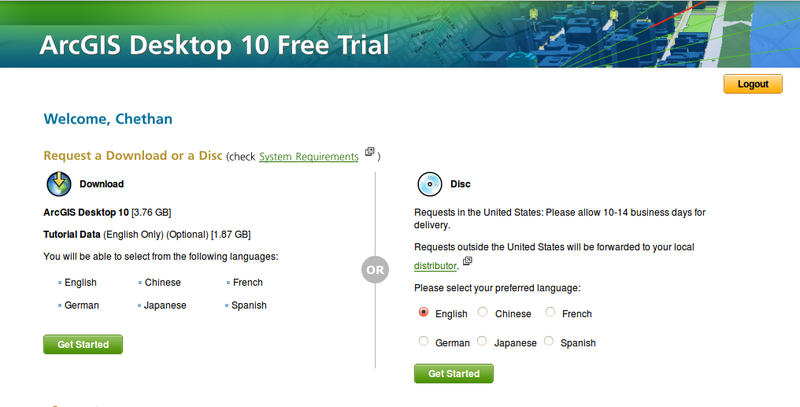 ArcGIS 10 is available for Download! In June 2010 I had written about esri's highly restrictive policies regarding making their software available for common users. See, ArcGIS 10: My big question for esri. Later for my academic project, I switched to FOSS GIS - GRASS GIS and Quantum GIS. Today I was casually browsing esri site to check if anything had changed over this duration. I was pleased to see esri now provide 60-day trial of ArcGIS, that too at ArcEditor license level plus several extensions. I had already logged in via my esri global account, so just had to click the link Get Your 60-Day Trial Now to be taken to a page with download or order options. 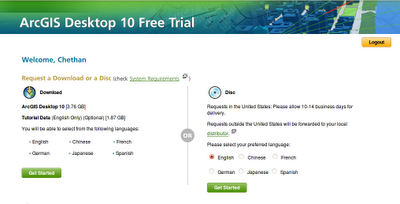 Option is also provided to download 1.87 GB tutorial DVD. So now one can experience the full power of ArcGIS. We must remember that so far (till version 9.3 and earlier stages of 10 release) getting a beta/trial/evaluation copy of ArcGIS was the privilege of under maintenance/support customers. There was always a 'Request a DVD' option but the local distributors never used to care unless you were a prospective customer. I am unsure from when esri started giving this option but I noticed it today and I am glad that they did. So now the situation has changed. Good going esri!